King of One-Liners: Take my wine ... please! Jon Fredrikson likes to say that there are no one-liners in wine. He isn’t saying that there aren’t any one-line jokes (take my White Zinfandel … please!) but rather that nothing in wine is cut and dry. Wine is always complicated — always this and that, too — so generalizing is a dangerous practice. I was reminded of this twice during our recent California expedition. The first time was by Jon Fredrickson himself, who stated the case very well in his talk at the Unified Wine and Grape Symposium in Sacramento (North America’s largest wine industry trade show and seminar series). His dynamic analysis of how the wine market is evolving was widely reported in the press. At the end of Jon’s report he always names a “winery of the year” and for 2011 it was DFV Wines of Manteca, California. DFV (for Delicato Family Vineyards) has its roots in the decision of Italian immigrant grape grower Gasparé Indelicato to try his hand at winemaking in early post-Prohibition California. His grandson, Chris Indelicato, has been CEO since 2004 and many other family members populate the company’s org-chart. DFV sits in the #10 position in the Wine Business Monthly Top 30 American Wineries league table for 2011, producing more than 4.5 million cases. DFV owns more than 10,000 acres of vineyards (quite a change from Gasparé Indelicato’s first farm). But it is the business’s dramatic growth, not just its large size, that drew Jon Fredrikson’s attention and, well, everyone’s attention. “Delicato” was all that I heard in pre-announcement speculative conversations. You have probably seen Delicato wines on store shelves, but they are just the tip of the family business iceberg. Other DFV brands include Bota Box, Twisted, Gnarly Head and many more. I usually think of the DFV wine portfolio in terms of good value wines and I think this good value accounts for the company’s success. But saying that a wine is a good value sometimes imposes a subconscious ceiling on perceived quality and distinctiveness. I admit that I tend to think of DFV wines as good, but not necessarily great. That’s because I sometimes forget Jon Fredrick’s line about one-liners. Good value doesn’t rule out distinctivenes — wine is too complicated for that. This point was driven home to me for the second time as I stood at the tasting room bar at Black Stallion Estate Winery on Silverado Trail in Napa Valley — DFV’s newest venture, which it acquired just a couple of years ago. The winery itself resists being a one-liner as it is both historically significant (as an equestrian center) and an architectural beauty. 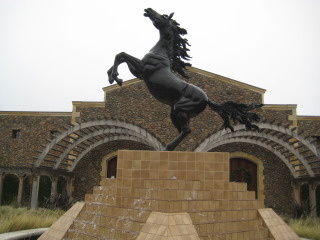 We drove by the winery a couple of years ago (on our way to a Stags Leap AVA event) but didn’t stop. We were impressed with the BSEW Cab at a tasting back home (it is a larger production wine that is widely distributed), so we came back to try the small production (4000 total cases) wines sold only at the winery. Imagine my surprise to learn that the same company that makes Botta Box also makes a $150 red blend called Bucephalus. I’m interested to see what happens as the Indelicato family’s winemaking knowledge and resources are focused on this relatively new enterprise — perhaps even more distinctive wines like the Rockpile Zinandel that was my tasting room favorite? I expect there will be lots of interesting wines to taste and things to say as DFV and Black Stallion continue to develop. But don’t expect to hear any one-liners.